We had a wonderful day in Sintra! Our guide was very knowledgeable and very nice. 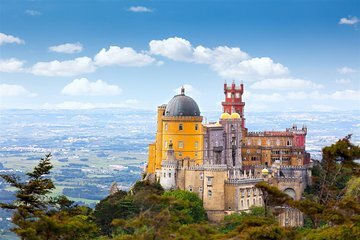 He added in a tour of the gardens at Pena Palace, which has one of the highlights of the trip. It was clear he knew the ins-and-outs of the route and the sites, often pointing out additional things along the way. He made a huge effort to ensure the the bilingual tour treated everyone equally and we all received the same information. We had plenty of time at all of the sites, so we got to see everything we wanted. The only negative for the trip was that the phone number on the Viator voucher is no longer active, so we were unable to confirm our pick up time. Nous avions réservé cette journée à Sintra avec la visite des palais de la ville et le voyage en minibus. Nous devions être accompagnés par un guide parlant français. Nous avions réglé 80 par personne pour cette journée. Première mauvaise surprise : pour ce prix, ni les visites, ni le repas au restaurant n'étaient inclus. Si l'on tient compte du niveau des prix au Portugal, le prix est complètement exagéré d'autant que Ricardo, au demeurant un garçon charmant et prêt à s'adapter à nos désirs, parlait un français incompréhensible et nous plantait à l'entrée de chaque monument avec des explications plus que succinctes lorsque nous les comprenions !! 640 nous étions 6 amis pour un circuit de 80 Km en minibus, c'est beaucoup trop cher !! En plus, la météo était détestable ce dont personne n'était responsable et nous n'avons même pas pu apercevoir le palais de Pena perdu dans un brouillard digne de Londres. Par contre, point positif, Ricardo nous a emmené déjeuner dans un restaurant typique à quelques kilomètres de Sintra RESTAURANTE TOCA DO JÚLIO à COLARES où nous avons excellemment mangé pour un prix très modique. Un très bon point. Mais nous avons été très déçus par cette journée. This tour was amazing! Our tour guide Carlos picked us up right on time, and we had the car to ourselves. He was very patient and entertaining with my children, ages 9 and 10, and he was incredibly knowledgeable both about Lisbon and Sintra, as well as the coastline. We first drove through Sintra to the Pena Palace, where we explored the palace and gardens. Carlos picked us back up, and we had lunch in town, where he recommended. The food was very good, and the people at the restaurant very friendly. We then walked around Sintra a little and had the local pastels. Then we headed on to see the Quinta da Regalaira and after that the gardens and palace of Monserrate. Both were beautiful. I'd have a hard time picking my favorite of the palaces and gardens we saw on our tour. They are very different and all worth a visit. We then drove on to the coast to visit the Cabo da Roca, the westernmost point of continental Europe. We had time to explore and take pictures, then we made our way home via the scenic route along the coast, passing through the town of Cascais. It was dark already and we were tired, so we did not want to get out and explore here, but it looks like a very charming coast/beach town to come back to. We had a great time, I highly recommend this tour, especially if you are as lucky as we are to have Carlos as your guide and driver. The trip was extremely disappointing. It started off bad and went down hill. The tour guide was late and arrived in an open backed jeep with two benches... He apologised saying that although we were the first to be picked up 15minutes late and were scheduled to be the last, we would try and get the other 2 couples before they gave up waiting! The benches were barely adequate for seating 2 people per side let alone 3! As we drove through the city it became extremely apparent that this was not going to be a comfortable nor a warm drive to Sintra. Sintra itself left much to be desired as the Palace was devoid of any furnishing or context and the gaudy colours and turrets made it look a poor imitation of Disney's castle. The Morrish castle was only given a 15 minute access to the outside but being a ruin would have been time better spent touring. We went to the end of Europe and to Cais Cais for a quick pit stop. The ride back to Lisbon at sunset on the highway in an open jeep freezing was not something I wish to try ever again. I find it extremely hard to believe that anyone would have thought that this was an appropriate means of transporting 6 adults at almost 100 per person. A total disappointment. Rod was the best he put up with 5 crazy American ladies without missing a beat. He was flexible, and thought quickly on his feet when we encountered travel issues. The restaurant he recommend for lunch was terrific. We had a blast and could not have been more pleased. We had a wonderful experience touring with Ricardo. He was very knowledgable and it was a full day of seeing wonderful palaces and the beautiful natural wonders of the country. We would highly recommend this tour.